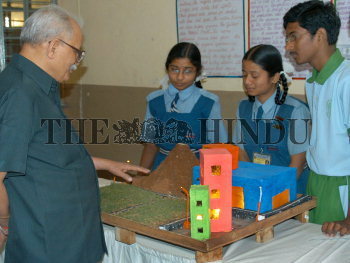 Caption : HYDERABAD: Students explaining to the chief guest Prof S.K. Dubeirector, IIT Kharagpur,about their project on Generation of Electricity from Geo-Thermal plant , in Science fair at Indian Institute of Chemical Technology on March 02, 2007 in Secunderabad. Photo: G. Krishnaswamy.